You may have heard that sugar feeds cancer cells and that you should limit your intake of sugar. But you may not have heard that this could include red meat. Beef, pork, and lamb may not taste sweet, but they are high in a little-known sugar: Neu5Gc. A new study shows that Neu5Gc can increase inflammation and may lead to cancer in mice. This study was conducted at the University of California, San Diego School of Medicine by researchers who were curious about the link between red meat consumption and cancer. 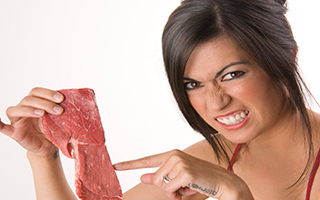 They first found that red meat is the main source of Neu5Gc in the human diet. Other studies told them that human tissues can absorb Neu5Gc, so they decided to see if this sugar was the key to the red meat-cancer connection. Our bodies see Neu5Gc as a foreign molecule, and the research team hypothesized that this could cause us to generate antibodies to fight it, leading to inflammation. To test their hypothesis, they engineered mice with a Neu5Gc deficiency and then fed the sugar to the mice. Not only did the mice show systemic inflammation, they also had a fivefold increase in spontaneous tumor formation. The mice in the study were not exposed to any known carcinogens, and the researchers did not make any other attempts to try to cause cancer in them. This suggests a strong association between the Neu5Gc and the cancer—in the mice, at least. Of course, Dr. Varki notes that "The final proof in humans will be much harder to come by, but this work may also help explain potential connections of red meat consumption to other diseases exacerbated by chronic inflammation, such as atherosclerosis and type 2 diabetes." However, other researchers point out that this study may be more than one step away from providing "final proof" that Neu5Gc can cause cancer in humans. Roger Clemens, adjunct professor of pharmacology & pharmaceutical sciences at the USC School of Pharmacy International Center for Regulatory Science, points out a few drawbacks to the study. First, Neu5Gc does have some benefits for humans. It helps us fight some viral infections, and a lack of it can actually increase our risk for GI infections. So it's definitely beneficial in small doses. And what constitutes a small dose? It's definitely not what the mice were eating. Dr. Clemens estimates that "the studied mice were fed an amount nearly 100 times (per kg bw) larger than any potential dietary exposure by humans. Also, this dose was consumed daily for about 50% of the typical lifespan of the mice." Plus, the mice were genetically engineered to have a Neu5Gc deficiency and then given the sugar directly. So it's unclear whether their consuming it as a component of meat would have had different effects or whether the genetic variation had an impact. This study certainly raises an interesting area of investigation. But red meat can provide beneficial nutrients, so don't cut it out entirely because of this study. Just limit your intake to once a day or less often. If you don't want to eat red meat, there are many other sources of protein that are safe to eat in larger quantities, such as beans, fish, and chicken. Other studies have shown that the main reason meat causes cancer is because those who it meat tend to not eat enough fiber. Fiber can help keep your body from absorbing so much of this sugar. Whether you eat meat or not, you need to eat about 30 mg of fiber per day. Annie N. Samraj, Oliver M. T. Pearce, Heinz Läubli, Alyssa N. Crittenden, Anne K. Bergfeld, Kalyan Banda, Christopher J. Gregg, Andrea E. Bingman, Patrick Secrest, Sandra L. Diaz, Nissi M. Varki, and Ajit Varki. A red meat-derived glycan promotes inflammation and cancer progression. PNAS, December 2014 DOI: 10.1073/pnas.1417508112.